Brighten up your home in an easy, quick and healthy way; using indoor plants as home décor makes for great aesthetics besides being environment friendly! The colour green goes with almost everything. So whatever colour palette you might have in your living room or bedroom, green plants will only make it better. Adding greens to your indoors helps clean the air, gives an instant uplift to the room and makes for an easy on the pocket decor idea. Tall plants, like indoor palm trees which are low maintenance, can make a big room feel cozy. They also make for lovely decor especially when placed in a corner. Green plants when combined with a mirror add much needed life to a small room. Small plants can be used in bathrooms, on dressers, side tables and center tables. Even a little bit of green makes an area look fresh and vibrant. So use a green plant or flowers to bring colour to your bathroom. Choose a plant that does well in humidity and needs low sunlight (if your bathroom doesn’t get too much of light) while choosing for the bathroom. Decorate the dining table with green ferns and plants in a vase or as a centerpiece. Flowers in vases look beautiful and striking. They can make any corner come alive. Use them to introduce an alternate colour into a room’s colour theme. If you love cooking using fresh herbs, then growing them in your kitchen or terrace garden is a great idea. The good part is you can make it into a lovely decor idea too. 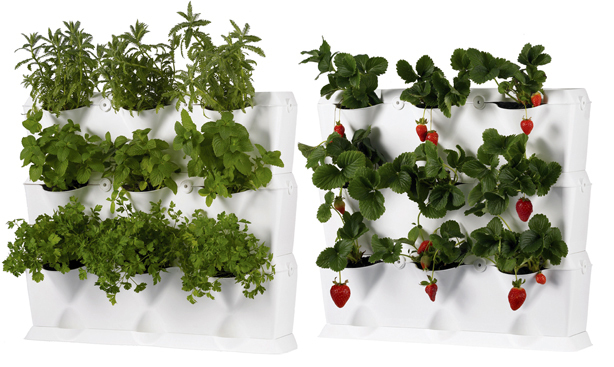 Go vertical and grow herbs on your spare kitchen wall in small buckets or tumblers. You can even grow them in colourful pots on the kitchen window sill. Choose the herbs that you like to eat. My favourites would be coriander, mint, dill, basil. Since most plants don’t do too well indoors without sunshine, you will need to get the herbs into the sun regularly or else pests will get them soon. If you have the luxury of a balcony or terrace then you can make it come alive with flowers and plants. It can become an extension of the living room or bedroom. Combine the plants with a grass lawn, a seating or entertainment area and you have a fabulous sensory experience. Shelves, hooks and wall mounted pots work as multi functional balcony space savers. Based on how much space you have, how much sun, wind and rain the outdoor space gets choose your plants. For example cactus will love a lot of heat whereas lettuce will not grow well in extreme heat. 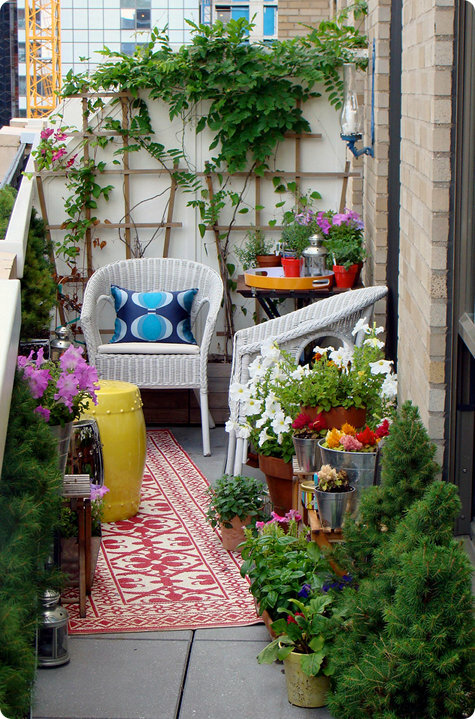 Do check your apartment rules, if any, about terrace or balcony gardening before you start. For an easy way to bring style into your home add hanging plants. They make for great decorative elements and bring a burst of colour. Use petunias, fuchsias, geraniums which grow in some beautiful colours. You can use a wide variety of outer pots to make them look aesthetically appealing. Think colourful wire baskets with liners, plastic baskets, rattan baskets, mosaic pots and ceramic containers. You will need to use an inner lining. The edges of your porch or balcony are perfect places to hang the baskets. For a symmetrical appearance, make sure they are spaced evenly. Bonsais can be used as beautiful art work on display. 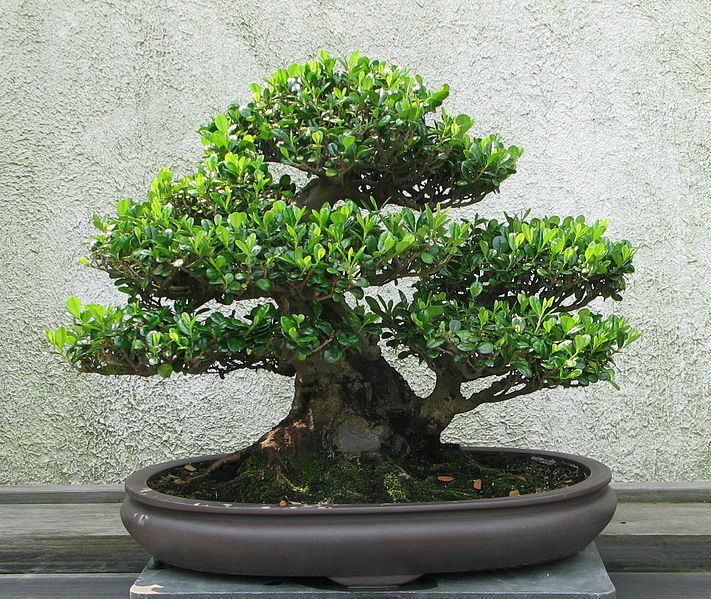 The word bonsai means ‘tree in a tray’. A bonsai makes for a striking centerpiece. Like any other art, they look great in groups too. A close next in terms of functionality and decor would be succulents. They are water retaining plants with fleshy leaves. They are very versatile and can be kept indoors or outdoors. Cactus is the first succulent that comes to my mind. Easy to maintain, less water, no special needs. It works great for people with brown thumbs. It has a lot of varieties that look lovely and can be used as a decor element. Fun and quirky planters and pots can be used to decorate your space. While the best place to buy plants would be your local nursery, to pick some unique and beautiful pots, planters and other plant accessories you can visit My Sunny Balcony or Green Essence. Ha ha ha Ila! Yes that was a moment 🙂 Thanks for stopping by the blog! Dear Simran beautiful teracota pots hanging. From whwre can I get it? That is a very creative way to use Indoor Plants.